I have been very lucky in my travels to Italy. I did a lot of work there and got to see a lot of the country and have lived both in the north and now in the south. I love everything about Italy. In so many ways it has figured out how to live happily. It is no wonder so many people want to go there. There is so much to see. Cinque Terra (north) – These five small towns were once very remote and unseen by most tourists. Then the train came and brought many tourists to this region. There is a walking path connecting each of the five villages. You can also take a boat, Life here is simple and enjoyable. Portofino (north) – This Italian fishing community and high-end vacation resort is famous the world over. The cove here is very picturesque. When I think of Portofino I can hear Andrea Bocelli singing here. Lucca (Central) – A city in tuscany near the sea. It is famous for its intact Renaissance-era city walls. 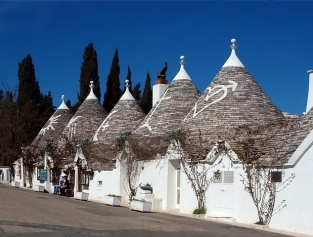 The Tulli Homes of Alberobello (south) – These unique homes are round with pointy roofs. This is a very unique architecture that is strongly enforced in this city. Matera – Italy’s cave town (south) – Originated in the Paleolithic Period. The cave dwellings here were once slums and have been transformed into luxury housing and rentals. This is one of the most un pique cities in Italy and maybe the world. Sicily (south) – This unique island has so much to offer. From the volcano to its magnificent towns to its Greek ruins. Sicily is easily reached by ferry, train or car. All three methods of travel cross to the island on the ferry. What is your bucket list for Italy? Why do Americans Love Italy? Is it any wonder we love Italy? Where else can you get people who love us, food that is the best, wine that is superb and views that rival any other place? Italy is unique. It was created by violent earthquakes and volcanoes millions of years ago. Today it is a pl;ace artist go to see the wonders of nature. Even places like Vesuvius, a still very active volcano, attracts us like a moth to the flame. Is it any wonder we look to visits this country over and over again? The views take our breath away. We want a piece of it. If you haven’t yet been to Italy, WHAT ARE YOU WAITING FOR? Go and see the major cities: Rome, Florence, Naples, Venice and Milan. See smaller cities like Capri, Positano, Amalfi, Verona (Romeo & Juliet). Get off the beaten path and see small walled cities with fantastic views. Experience chocolate in Perugia (home of Perugina chocolates – Baci). Go to Assisi and Siena and our favorite San Gimignano. Don’t miss Tuscany, Orvieto and Pompeii. Italy has so much to offer it would take a life time to see it all. So don’t wait, get started on your adventure. Be adventuresome, be romantic and enjoy your life. 1) Get a general idea for timeframe. This is important to determine airline costs, clothes to bring, and sites to see. 2) Price your airlines and hotels. Remember saving a few hundred dollars on an airfare that adds 10 hour stop overs is not a wise use of your money. We choose Italian hotels but insist on private baths. 3) Pick the main cities you want to see. Don’t try to do all of Italy in a week or two. All you will see is the inside of planes or trains. Good size trips are a) Northern Italy (Milan, Verona, the lakes and Venice), b) Tuscany, c)Rome and Orvieto and Pompeii, d) Naples and Capri, e) Amalfi Coast, f) Southern Italy and g) Sicily. 4) Now look around each city on a map and see what small cities are close by. Research them on the internet. If you find a great city plan on a visit. Maybe it is to see a festival or a museum or taste wine. 5) Now list the top ten things you want to see in each place. More than ten starts to use up a lot of your time. If you are going to a major museum list the top ten things in the museum you want to see. 6) Determine how you will travel to each city and in what order. Will you need a car or go by train or plane? 7) Now estimate the amount of time you will need in each city. This is critical in doing the things you want to do. 8) If your total time is more than you can take, cut something out. If you have more time, add it to tight cities. 9) Make a list of hotels, addresses, phone numbers and costs as well as museums, etc. This will help when you arrive. 10) Make a check list of what to pack and what to do before leaving like Passports, Euros, turn water off, camera, umbrellas, etc. The most important thing about traveling in Europe is to be spontaneous. If you find something unexpected, add time to enjoy it and cut something else out. The important thing is not to check off everything on your itinerary but to create lasting memories. Be romantic and enjoy the country that created romance…Italy! City Passes sometimes look expensive unless you are going to see most sites included but can still be worth the money to save hours of time avoiding lines. City Passes usually allow you to go to the head of the line and have minimal or no delays. What to see in Italy? Many people hop between the neighboring border towns of Nice and Ventimiglia with a train ticket. A trip so close, and made even easier with a France-Italy Rail Pass. You’ll find both French and Italian regional lines service Ventimiglia. More than a train hub, Ventimiglia has a stunning, quintessentially Italian medieval city center. As it always has, its classic architecture stands guard on a hilltop over the Gulf of Genoa, but now with the new city between them. Make sure you visit Ventimiglia’s famous Friday Outdoor Market! Why not visit the oldest university in the world, the University of Bologna, founded in 1088? Naturally, there’s plenty to study: from medieval, renaissance and baroque monuments to modern-day industrial marvels like Ducati, headquartered there. More high-speed thrills? Travel by train from Bologna to Verona in just under an hour. What do you call a city dramatic enough to be the setting of three Shakespearean plays, and interesting enough to be named a UNESCO World Heritage Site? This is Verona. Along the Adige River, this picture-perfect city of cobblestone streets lined with medieval buildings, Roman sites and churches is second to none for inspiration. Known for its pink buildings and Juliet balcony (yes, one of those plays was Romeo and Juliet), a visit to this city will immerse you in the classic Italian experience. Want more inspiration? Venice is one of the perfect destinations for it. Verona to Venice is about an hour by train. Located on the Gulf of La Spezia, this port city is a bustling mix of old and new. This scenic waterfront is perfect for arrival by train from Verona (via Milan) with a Eurail Italy Pass. Today, this modern-day port stands in stunning contrast to the spectacle of its antiquity and charm. So much charm that many poets have found inspiration here, from Byron to Shelley to DH Lawrence. It is, in fact, referred to as “the Gulf of Poets.” What will it inspire in you? Baroque architecture with the Alps as the ultimate photo backdrop. Site of the 2006 winter games. And, of course, the Shroud of Turin. The amazing city of Turin is one of contrasts that include a café society of truffles, wine and other extravagances, and Turin Cathedral, home to the Shroud of Turin. (Please note that while The Museum of the Holy Shroud is open daily, the shroud is only displayed once every ten years.) Next stop? Milan. Aboard Frecciarossa trains, Turin to Milan is just about an hour’s journey. High style all around. The Italian center of finance, industry and commerce, as well as a global capital of fashion, industrial design and architecture. Milan is also the home of “The Last Supper” by Leonardo da Vinci in the refectory of the Convent of Santa Maria delle Grazie. Don’t miss the spectacular Duomo, which took over 6 centuries to complete. (And don’t forget to get your Milano Card for easy transportation and discounts all over town.) Also, remember it’s just as easy to arrive from Paris to Milan by the high-speed TGV trains. The birthplace of pizza has drawn many hungry visitors, including those hungry for culture: its historic center is the largest in Europe, covering over 4,000 acres and 27 centuries. It’s almost unreal how much this port city has to offer — including hydrofoils to the Isle of Capri and the Blue Grotto. Naples is a must-see for every history/arts/culinary/naval/political/cinema-buff. And so is Venice. Naples to Venice is about a 4 hours and 45 minutes journey by train. Venice, the land of gondola-filled canals, ancient trades and water taxis. Enjoy a Grand Canal boat tour and views that have remained basically unchanged for centuries. See how Venetian glass and Venetian paper is made. Shop on the Rialto and along the waterways to roving (and rowing) tenors, as well as the occasional accordion. There is only one Venice, so how could it be #3? Well, the saying is “all roads lead to Rome”. Fortunately, so do the trains! Travel from Vienna, Innsbruck or Munich to Rome via direct overnight trains. All those “Roman ruins” around Europe, why not visit their birthplace? And where else can you see the Colosseum? Classical architecture buffs will enjoy researching the arch, the dome, and the vault—all developed here. Of course, a Vatican Sistine Chapel Tour is guaranteed to provide a most divine experience. This is it people. This is where the world changed. And when you visit, well, it can change your world too. There are so many interesting places in Italy to enjoy! If you have seen the 2010 movie Letters to Juliet, you know it takes place in Verona. Letters from lost lovers are left on a wall for Juliet to to answer. Who really answers these letters? It is the Club di Giulietta. Of course the story of Romeo & Juliet is fictional but many believe Shakespeare was inspired to write this play in Verona. He may have seen the now famous Balcony of Juliet and got the idea. What ever the truth is, Verona has capitalized on this tragic love story. There is a statue of Juliet with bare breasts that is suppose to give you good luck in love if you touch them. So many tourists do this, that her breasts are wearing down. There is also a balcony next to the statue which is supposed to be where Romeo told Juliet he loved her. You can feel romance & love in this town. 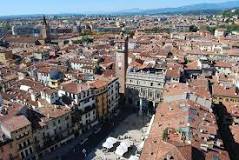 It is similar to other Italian cities with its restaurants, gelato stores, bars, museums, churches and views. Driving in the old section is restricted. Get a hotel room and re-live your love. Enjoy Italy and Verona.